Thoughts on the Table was created by Annie Myers in September of 2007. The site serves different purposes throughout the year, though always to document thoughts and share current ideas pertaining to regional food systems. I’ve worked an entire year at Pete’s Greens, and now (somewhat earnestly) joke about wanting to live in Craftsbury my entire life. The storage crops are almost all harvested for the year – we have turnips, storage radishes, rutabaga, and a few fields of carrots still to go – and the mornings have officially shifted from early morning harvesting while it’s still cool, to sorting onions in the washhouse until it’s warm enough outside for our fingers to work quickly. I will be taking January off from the farm, and will be working only part-time in February, in order to begin transcribing my recordings of an incredible Vermont woman, whom I met working at Pete’s. Clearly (from what you’ve seen here on the site), harvest season work did not leave me with much space to write, and it is perhaps the only thing I have missed, this summer in Vermont. I intend to write much more this winter than I have in the past year, and look forward to it. After a two-month post-fire interim, I started working at Pete’s again in early March. The past few weeks have been colder than usual, and rainy, but the snow is finally melted and gone, and the hills and mountains have begun to regain their color. These days are full of planting seeds, untangling last year’s row cover, laying out irrigation lines, and monitoring the solar heat in the greenhouses that keeps rising to the high temperatures we crave. The storm of summer will hit us soon enough. The past two months at Pete’s Greens have given me a hearty introduction to stored root vegetables, rubber overalls, barrel washers, and frozen fingers. Last week, on January 12th, the farm suffered an enormous loss. The farm’s barn – including the season’s harvest, two tractors, all of the washing facilities, and a barn addition that was nearly complete – burned to the ground. My time here has not come to an end, I hope! But I am finding my way between potential work, road-trip plans, and cross-country skiing to my heart’s content. Pete’s Greens should be up and running full-swing by April. Until then, I’ll be seeing what surprises the winter brings. The last tomato stake has been pulled out of the ground of Eckerton Hill, and we are going to market with the last of the winter squash and brussel sprouts, cardoons and sweet potatoes. 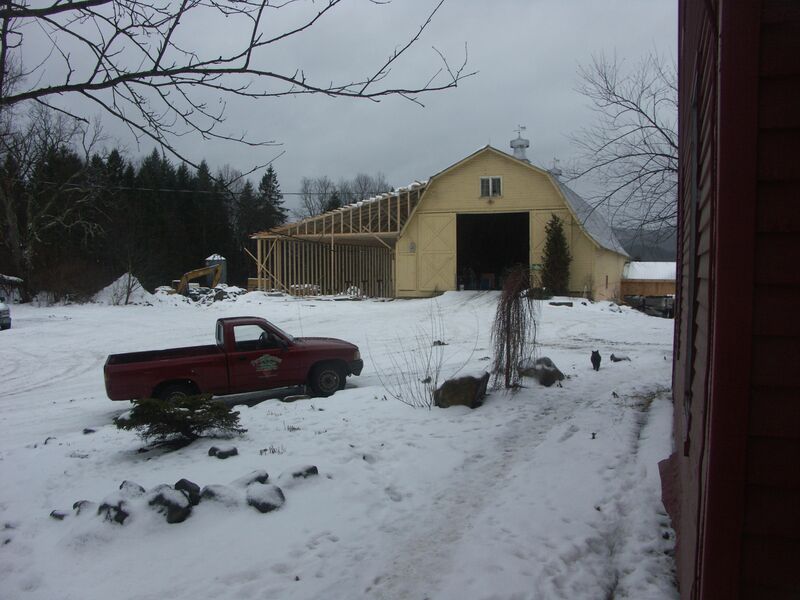 Before the month is out, I will have moved out of Eckerton and up to Northern Vermont, to work on a four-season vegetable farm in Craftsbury. I will be farming through the winter, washing roots and cutting greens, maybe also making cheese, definitely cooking, hopefully writing. I’ve clocked one month at Eckerton. The tomatoes are soaking in the heat, and we have started picking! Stupices and sungolds, black cherries and tiger toms, jollies, isis candies, wild mex, and juliets. Corn and okra are just coming in, summer squash is at its peak, lettuce and string beans and snap peas are out. The aphids abound, the rain is held up, and the goat is ever in need of milking. Soon there won’t be time for the swimming hole….. The Spotted Pig and The Breslin have a new Forager! 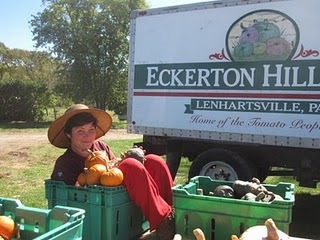 And I am moving out of Brooklyn, hauling my belongings to Eckerton Hill Farm in Kutztown, Pennsylvania. 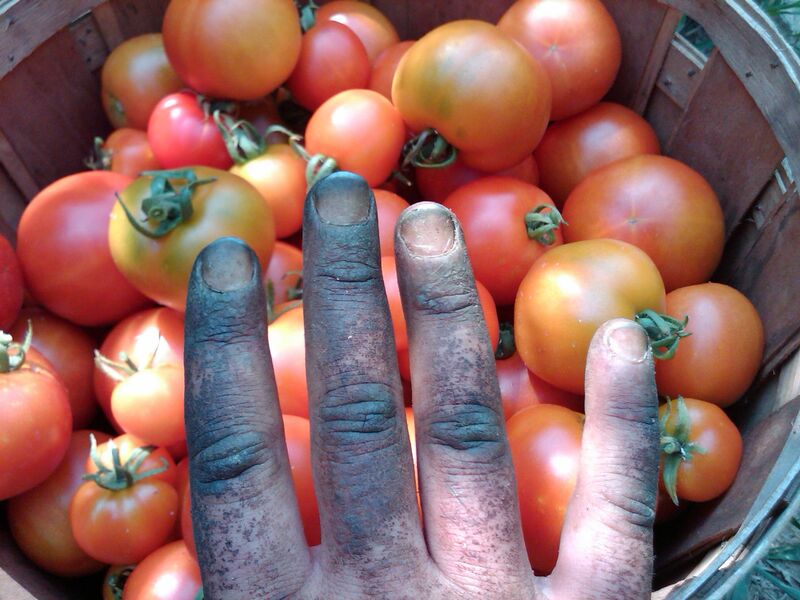 I’ll be working for Farmer (and writer) Tim Stark, along with Wayne Miller and Nelson Harvey, picking and packing dozens of varieties of heirloom tomatoes and peppers, to sell in Union Square at the Eckerton stand. Nelson and I will be honing our culinary, cocktail, and cheese-making skills on the farm…in preparation for our friends’ visits from the city! 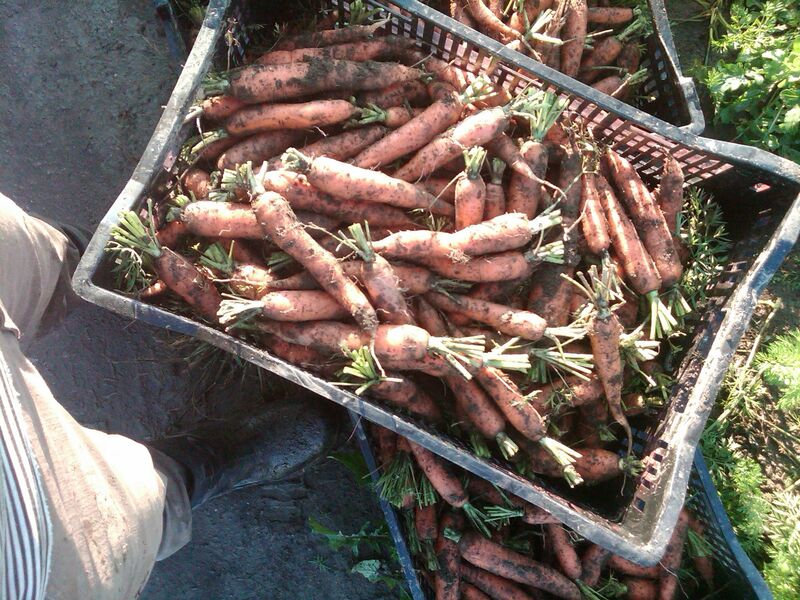 While I’m still the Forager for a restaurant in Manhattan, this is a job (hurrah for these!) in which the change of season is a change in the work. The search now is for seedless grapes and winter squash, sweet onions and hearty greens, odd meats (thanks to Chef Fergus) and honeycrisp apples. We can only hope that the Fall season will prove more friendly than the Summer of rain and blight. I continue to write, more often I hope, and continue to learn. 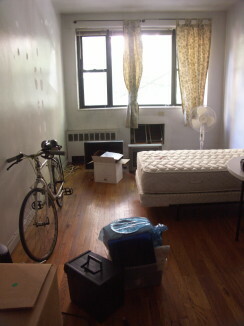 I’ve signed another lease in Brooklyn! And am working in Manhattan as the Forager for the Executive Chef of two Manhattan restaurants, sourcing as much of the restaurants’ food as possible from small regional farms. I will be supporting the New Amsterdam Market as it plans to go monthly next season, and Radishes and Rubbish will continue in the fall, as long as I can find funding and a student apprentice! Before graduation, I will be earning my Permaculture Design Certification, researching Farm-To-Institution networks, leading a series of Radishes and Rubbish field trips, and helping out with the New Amsterdam Market project. I am also applying for full time employment. The first semester of my final year at NYU has begun, with courses on Land Use and Housing, Politics, Social Entrepreneurship, and International Economics. Throughout the fall, a friend and I will be leading Radishes and Rubbish, a series of trips to small-scale food production and processing sites, and waste management locations, throughout the city. Do check out the project website for more information! My bicycle and I…are back in Brooklyn! I’ll be working this summer for the New Amsterdam Public Market Association, primarily writing essays and conversation summaries, related to Executive Director Robert Lavalva’s vision for a permanent public market at the Seaport in Manhattan. 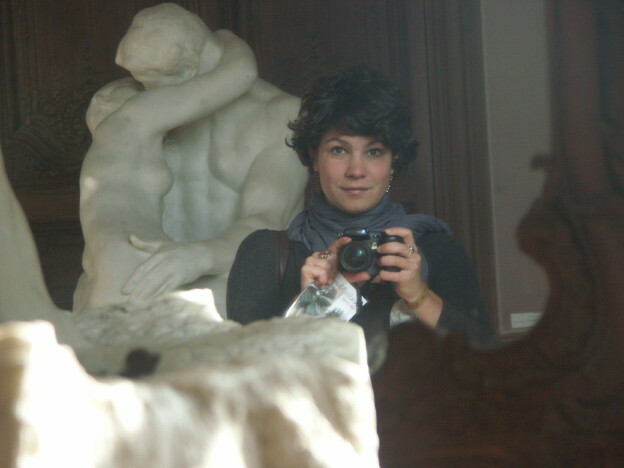 My writing may be found both here, and (soon) on the New Amsterdam website. I’ve moved, from Brooklyn to Berkeley. I’ll be living here at least until May, taking classes at UC Berkeley, as well as finding my way into the local food movement and the community working towards food justice on the West Coast. All in the hopes of gaining knowledge to bring back to the East, I’ll also be visiting and learning from the worker cooperatives and collectives in the Bay Area. Students from across the Northeast are planning a gathering at Yale on November 3rd and 4th: the Real Food Summit (see links on Home Page). We are organizing meetings, across the Northeast, in order that students working on food and agriculture within Colleges and Universities might meet each other and begin to collaborate now. The students working on this event and other relevant projects at their schools are welcome to use this site! To Set the Stage (Or Table, As It Were). Considering my academic focus on “Agricultural Economics and Politics,” current projects that involve a summit on food and collaboration among local farmers, and the rather predictably environmental or agricultural topics of my conversation, people often ask where in the country my family lived before moving to New York, and why (in the world) I’m studying at NYU. The truth is, I haven’t spent more than three months at once in a rural setting. While my family has moved up and down and across this country, we’ve always lived in or near cities. And I study at NYU…because two years ago, I thought I wanted to go into politics, economics, and journalism, and I didn’t want to live in the middle of nowhere. So “Where does your interest in food and agriculture come from?” is nearly always the next question. In an attempt to see in the roundabout past a reasonably linear path to the present, I answer that I lived and worked on a farm in Italy for three months, during a year off after high school, and then lived in El Salvador only weeks before the Central American Free Trade Agreement was passed. Ongoing protests against CAFTA meant that I listened to the articulate testimony of many Salvadoran farmers, who explained how their lifestyle, land, and culture was falling to the “new conquistador” of imported, unjust trade policies, even as they spoke. Their desperation contrasted sharply with the hopeful engagement I’d witnessed on the European farm, where neither government policy nor personal productivity was ideal, but where the land and culture had seemed alive with possibilities. In El Salvador, CAFTA had cast away hope in small-scale agriculture, and threatened that beautiful country with destructive power that no independent farmer could hope to escape or avoid. Truthfully enough, working in Italy and El Salvador did awaken whatever soil-sodden part of my soul had until then laid dormant. But my work in college began with a look to farmer-related policy and economics, researching and protesting unjust Free Trade Agreements, and advocating internationally-organized support of small-scale, organic farmers (i.e. Fair Trade certification, and regional labels). Two years later, I’ve come to approach the future of small-scale agriculture with the same principles in mind, yet in the land where I might have logically started, in my own community, in New York. Recognizing that there could never exist one true expert on global, national, or even regional food and agricultural issues, I’ve woken up to the productive, rewarding, joyful (and numerous!) farmer-focused projects in Brooklyn, New York, and the Northeast. Inspiring movements and collaboration of family farmers, in support of sustainable agriculture, exist across the globe. But such movements begin with the community they affect, with people who know their land and its needs, and the ways and values of their people. 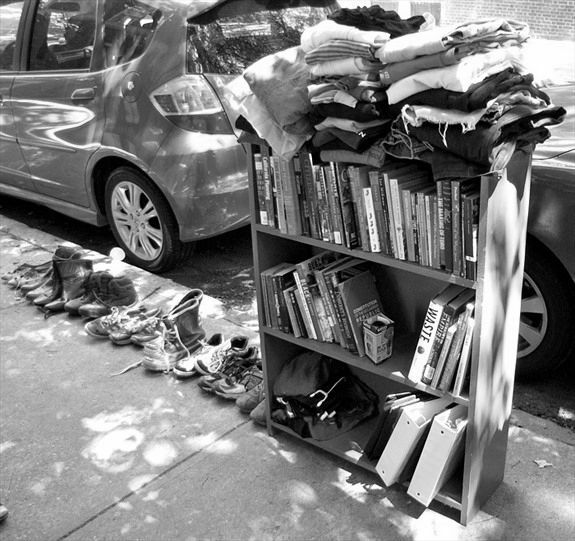 These needs and ways and values are what I hope to address in my future essays – as well as what is at fault with traditional agriculture and with current farm and trade policies; what the alternatives are as we know them; and the wonderful, joyful ways we can (and the way people already do) take advantage of these alternatives. Writing here, however I address “soil and food,” I hope to do so with recognition of my belief that these two elements affect and are affected by all aspects of society, including economy, politics, community, health, religion, race, and quality of life. Still, this belief has led me to value achievements and actions that are small-scale, open-minded, and personal. Community Supported Agriculture sites organized by Just Food, projects led by Sustainable South Bronx, the products of Added Value in Red Hook, Adam and his thoughts on The Wild Green Yonder, the locally-grown dinners hosted in my and my friends’ apartments…My work has begun to revolve around specific people, embracing their company, and cultivating the creative ideas that form even around my little table, over the consciously-purchased, thoughtfully-consumed meals we share. I have found that when my friends and I make initial, informed decisions about an essential daily activity – eating – we tend to maintain a pattern of close attention paid to our actions, particularly as consumers. We tend to avoid relying on detached priorities of convenience, popularity, affordability, and ease, in all we do. We are empowered, through joyful recognition of our interdependence, within our community, and in our life within nature, rather than weakened, by the common delusion that we can live our lives “independent” and alone, strong and secluded. We cannot. We never have. And so, while keeping tabs on the big food-and-farm picture, the policies and the agreements, the campaigns and the movements, I hope to work these next years, and write these next pages, with soil on my hands, with friends sharing thoughts around my table, and with enough laughter and dancing to know that what we seek is a joyful end, of an interdependent, healthy, sustainable community, aware of each other, proud of how we live. Only then will we have something worth sharing with others.